Adaptive Layer Heights is a new feature in KISSlicer 1.6 and it's, well, it's sublime as you are about to learn – and why I love KISSlicer: Reason #6! When Slic3r Prusa Edition 1.33.3 introduced its Variable Layer Height feature earlier this year, it was very well received. Now, those steppy looking top layers on curved parts could finally be smoothed out by decreasing the layer heights in only those areas. So, you get the advantage of thinner layers where they are needed without paying a big penalty in much slower print speed. Little did the world know that KISSlicer had a new feature up its sleeve! 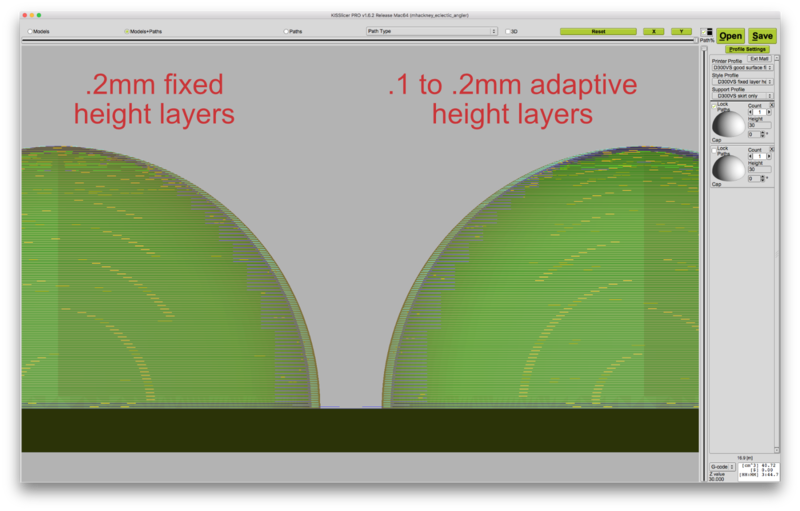 KISSlicer 1.6's Adaptive Layer Heights feature is conceptually similar but completely different! In Slic3r's implementation, the user has to manually create the layer height changes and gradients – a bit of a pain and the user has to have a lot of knowledge to know when they get it right. KISSlicer completely automates the process of smoothing out these curved areas with thinner layer heights – that's why it's called adaptive layer heights. Here is a screenshot that shows a part sliced using typical .2mm fixed-height layers on the left and with the new Adaptive Layer Height feature from .1mm to .2mm on the right. 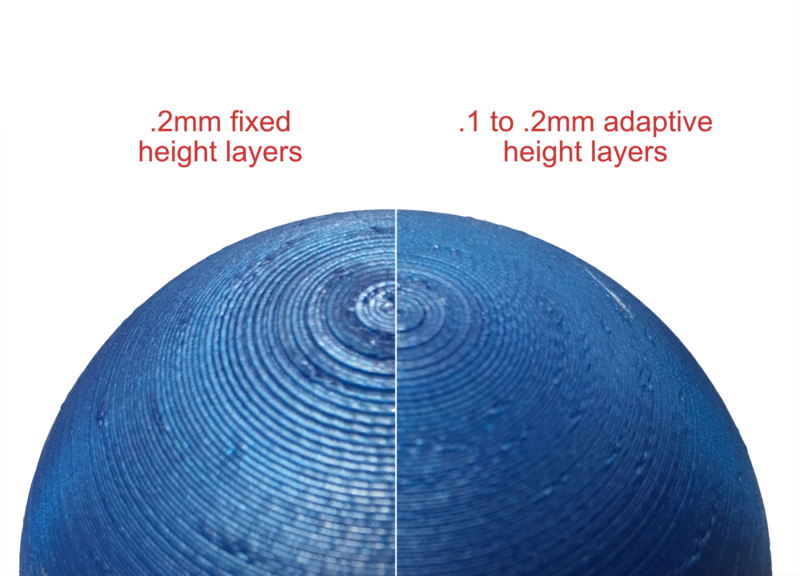 If you zoom in and look at the very top of the hemisphere, you'll see the layers in the adaptive slicer are much closer spaced and the curvature is much smoother. As you can see, the layers on the right are thinner and the curvature is much less stepped in appearance. That's Variable Layer Heights at work. 7 comments to ''Why I love KISSlicer: Reason #6"
I like the feature I'm with Kisslicer and I do not find the feature in the program could you elucidate? Thanks. Specify your minimum lauer in Layer Thickness and your max layer in Max. 1st is your first layer. Leave the stepovers to 125% for both. I'll see right now. Thanks for the quick response and I've already seen all of your youtube videos. Thank you. Good morning, I made the changes but I have doubts of its application in a piece with several places with details, how can I use with efficiency? If I had a video explaining it would be very useful for me and a lot of people. Thank you to all the videos that made it clear and I used Kisslicer again. That is exactly the kind of part that adaptive layers works best in. I don't know what you mean by "how can I use with efficiency?" I am working on a video on this but I'm a little behind on video production for a few weeks. Well I do not speak the English language so the translator was not happy. What do I mean by giving a beginning and end of layers if the piece have several places of details and the question is this how to use it where I want? I'm going to wait for the videos and help me with what happened. Hugs. Very ineresting and usefull information, thanks for shareing!!!!!. 1 question: maybe because translator might not be that accurate, but I dont understand the use of stepovers values. Default values are in 50%, you say 125%, how affects both values the adatptative layers?